Drie Fonteinen Cuvee Armand & Gaston 1.5 liters! Blend of lambics aged on average 16 to 18 months and of Muscat grapes. 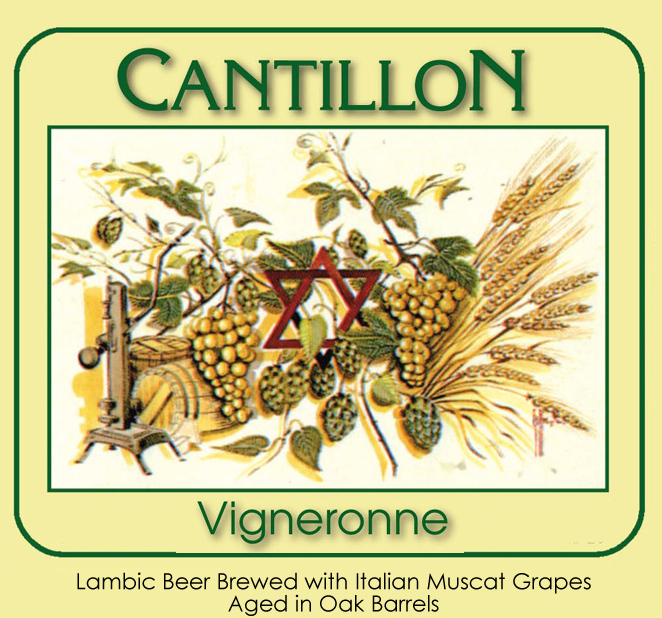 Muscat grapes make Vigneronne a delicate and very refreshing beer that, due to the fructose, is slightly less acidic than other Cantillon beers. It is difficult to produce more Vigneronne even though the demand exists. All the grapes are picked from the bunch by hand and we don’t have much time, since the new brewing season starts at the end of October. The beers are not blended before the bottling. The second fermentation is caused by the addition of a sugared liquor. The six-pointed star on our label is an alchemist’s symbol. It contains four elements, represented by triangles, of the brewing process. The fire is the symbol of the mashing tun, the earth of the cereals, the air of the yeasts, and the water is the fourth element. At this moment, only a brewer of traditional lambic may use this symbol.